It is hard to talk about how my work is perceived. I think it’s received well but there have to be enough critics from the continent reviewing it for me to learn how it is perceived. When I started, people doing the kind of work I do in my country were negligible though some existed in other countries. All I can say as my mother often says, ‘the future is abundant’. I first came across Rehema’s work about a year ago, when researching for an exhibition that I was curating on negofeminism, featuring African women artists. I understood Rehema’s work as a tribute, not only to her foremothers, and their skill set to go through moments of hardship, but, for extension, to all foremothers across lands and peoples. Fortunately, she is temporarily based in London, so soon after the exhibition ended I met her in person. Our unfinished conversation led to another encounter and galleries visit; and then another and more conversations. We have gathered in interview format fragments of these conversations in relation to foremothers, rituals and art biennials. Raquel Villar-Pérez: You have been invited for the second time to exhibit at the Dak’Art Biennale. The first time was in 2012, and the current one curated by Simon Njami. What’s your experience of exhibiting at such event, and how do you see the future of these exhibitions in Africa? Rehema Chachage: A challenging experience yet full of potentials. Why? In my views, the biennale can be a very useful space, depending on the kind of artist you are, and what you look to gain from these platforms. It certainly can be a good space for visibility. I can say, my experience this time round was more fulfilling than the first because I exhibited work. The first time I participated, my work never even arrived. Technically therefore, I did not really participate. Rather, I divided my time between finding out what happened to the shipping of my work, which me not speaking French didn’t help very much; and explaining about it for those who anticipated seeing it. I only recovered my work long after the Biennale finished. An art biennale is a marketplace for artists. It is space for exposing your works and practice to people who can take them to places, making strategic contacts, creating friendships and community, and collaborations (things we sometimes take for granted). It is as well as an opportunity for appreciating the diversity of art practices and inspirational works; learning from fellow artists, curators and critics. Specifically, participating in the Dakar Biennale also offers an opportunity to explore and experience the Senegalese art scene and take pride in one of the most vibrant art events happening on the continent. However, the logistics and technicalities involved in getting your work in, installing, etc are honestly a challenge. In both occasions, it was a laborious and draining experience; almost as if one is participating in a mini residency of sorts. I am not sure what the future of these exhibitions is at this point. Overall, I am optimistic given that increasingly there are prominent ones taking place on the continent; it is my hope that curators and organisers will take a serious consideration on recurrent logistical glitches to ensure that these events become mutually beneficial for the artists and curators than they currently are. Raquel: Your work exhibited at the Dak’Art Biennale is titled Part III: Nankondo, being Nankondo the name of your great grandmother. Can you tell us more about this work, your relation with your great grandmother? Rehema: This artwork is part of a bigger project that I have been working with since 2012. This project uses the motif of ritual performances to explore nuances in gender and generation. My curiosity with rituals started with a personal interest in historical (herstorical rather) narratives that rooted from personal stories of my mother’s, grandmothers’, and great grandmother’s generations of hardship due to discriminatory social, economic, and political systems. They used cultural and spiritual ritual and performances such as rites of passage—birth, marriage, death, etc. as mediums for moulding, resisting and subverting the status quo. One can easily look for clues in ritual performances, where factors such as class, generation, the construction of gender and other identities are inscribed and demonstrated. This specific artwork, PART III: NANKONDO is created in collaboration with my mother, who creates text responses to my visuals [Intergenerational conversations have become an important element to my work]. In this work, we explore African spirituality, following a story of my mother’s great grandmother, Nankondo. The work exists as a video and text installation on a bathtub, but it is also meant to take form of a shrine, one that is meant to summon Nankondo’s presence for us to have a conversation—for me to make sense of her times and in the process, I begin to understand and make sense of my own situatedness. Nankondo, my matrilineal ancestor five generations back, disappeared from her village, and as it was common during this time in history, it is believed she was abducted and taken in to slavery, transitioning through the Pangani coast to most likely end up in Zanzibar (or beyond). History tells us that by 1985, an estimate of some three-fourths of Zanzibar’s population were either slaves or recently manumitted slaves, most of whom labored on clove plantations owned by the islands’ Omani aristocracy. Many of these were captured by Swahili traders from the interior, in areas that we now know as present day, Tanzania, Mozambique, and Kenya. Therefore, there are many of us coming from, or owing our ancestry to these regions who are in one way or another (unknowingly) epigenetically connected to the memories and traumas emanating from the history of slavery. The abolition of slavery was succeeded by colonialism which literary rode on the back of the conspiracy between the bible and the gun. 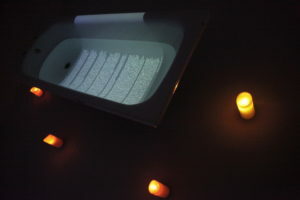 The installation consists of a video taken during a night prayer session, accompanied by a letter written to and in conversation with Nankondo, by my mother, projected on a bathtub filled with water and surrounded by lit candles. The work tries to make sense of the self-loath and spiritual abyss as displayed by modern day society as residues of history. Raquel: I can imagine that the use of candlelight in Dak’Art has to do with the idea of shrine and spirituality that transverses the work. The bathtub is referencing the container in which your grandmother was baptised, Christianised, just before dying. The piece is highly charged with symbols. Can you talk further about the choice and use of symbols in this work in particular, and in your art practice in general? Rehema: I do use a lot of symbols. I think for me, their role is really to speak on my behalf, to carry the ideas through, but also (hopefully) without being too literal. I also like to observe different transformations that take place in the work through these symbols, and their performative potential. In this work for instance, I have left it in Dakar for one month unattended. Surely, by now, the candles have died out. The bathtub has most likely gathered a lot of dust. And, because of these processes, there are probably some erasures taking place on some aspects of the work. I find this interesting, because the work now gains a life of its own, as it becomes very performative. Raquel: In the letter you make reference to the monsters named Valungwana. If I’m not mistaken, these refer to those who would break families, such as your grandmother’s by taking her mother, that is Nankondo, away. You also mention in your letter how these monsters would break families. In Nankondo’s times, Valungwana were those capturing slaves. Do you think nowadays the Valungwana monsters still exist, and if so, who do you think they are and how abductions are performed? Rehema: Valungwana is the name given to costal ‘noble’ persons, as opposed to slaves after the Swahili title ‘Waugwana’ they used to identify themselves. Metaphorically, it is indeed used to refer to all those ‘monster’ like outsiders who were agents of systems that spelt doom to our people and society; and yes, they do still exist. The methods may not be in the form of literally ripping families apart, although in the case of human trafficking it may just be that; but, there are still many systems in place that allow some to rob others the very right to life and dignity. Raquel: The textual part of the work is an intimate letter to your great grandmother Nankondo, in which you ask her spirit to free you and your family from the shame carried after the given reasons for her abduction, these being that she was a woman of low morals, as she used to sell beer in the market until sold out in order to fed her family. Her story has been passed on to you. What made you doubtful about the veracity of it? Rehema: Selling beer in the market was not as we know it today. Traditional beer was a (processed) farm product that women took to the market if they harvested enough sugarcane for brewing beer for home consumption and a surplus. Her only ‘crime’ is that she tarried when the others left the market place because her beer was not sold out. Tell-tale has it that someone spread a rumour she was directed to a place where men were gathered for leisure, thinking she would sell faster and leave before sundown she ended walking into a trap. Valungwana were camped there. My mother believes the story about her being of low morals was created as a copying mechanism for those left behind, some sort of stigma (‘blame the victim’) for being enslaved. Her daughter believed those rumours and lived with that stigma. Raquel: Earlier you mentioned that Intergenerational conversations have become an important element to your work, particularly conversations with women in your family. Indeed, prior to Part III: Nankondo you produced Parts I: Rumination with Orupa Mchikirwa & Part II: Conversation with Mama. Tell us more about these two art pieces. Rehema: The texts for all the three parts were written by my mother. They are textual responses to my video piece Letters to… (2016). This video for me, was entirely created as a tribute and a love letter to my grandmother for the love and care she had shown me in the two most life changing experiences of my life, the births of my two kids. As response, and/or in conversation to this video, my mother wrote these two pieces, ruminating with the two important female figures in her life (her mother and grandmother), and processing through the writing some of the most difficult conversations that she never had with either of them, concerning life, death, and becoming. 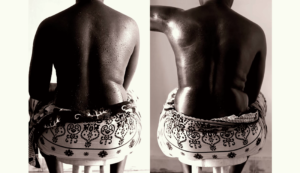 Raquel: What do you learn from your foremothers through these rituals of sharing herstories? Do you think the personal is political? If so, what we, other women from other lands, can learn from your foremothers’ experiences? Rehema: The personal is political because the space we occupy and relations we create for our very survival is a social construct. How we navigate those spaces in conformity or in subversion is equally political. Besides, personal politics can speak to/engage with the universal ideas, ideals, questions, politics, etc. Essentially, every individual has a position in those politics. Personally, I have used the work as an avenue for understanding, processing, and archiving these histories. As an artist, I am not trying to prescribe any kind of feeling/response/ lesson through the work… though obviously my world view cannot be separated from my practice. Raquel: In many of your works you collaborate with your mom who is a writer/poet, including the letter to Nankondo. Could that be translated onto the form of another ritual for creation? Rehema: I think it could be. Essentially, everything can, in one way or another, be looked at as a ritual—the process of making art itself can be viewed as a form of ritual. For me, however, I consider this almost as a process of ‘archiving’. The studio for us, becomes a space where this handing down of histories can manifest, and can be preserved in the form of an artwork, an essay, a publication, etc. Our ritual include researching and oral storytelling that inspires the conceptualisation of my art work; after which we separately and individually create her text and me the visuals—putting the end result of the two processes together is some sort of conversation across generation and across artistic media. Raquel: Your work is highly mindful and conceptual. You use a visual language that challenges the most well-known African aesthetic traditions, yet it relies in African traditions and rituals. How is your work perceived in Tanzania and in Africa in general? What are the opportunities for evolvement for a conceptual artist in the continent? Rehema: It is hard to talk about how my work is perceived. I think it’s received well but there have to be enough critics from the continent reviewing it for me to learn how it is perceived. When I started, people doing the kind of work I do in my country were negligible though some existed in other countries. All I can say as my mother often says, ‘the future is abundant’. Raquel: You are finishing your MA in Contemporary Art Theory at Goldsmiths, University of London. How important do you think it is the academic experience for an artist to grow, and how do you think it is going to affect your future art projects? Rehema: I think everyone has a different take to it. But, for me personally, academic experience has helped my growth tremendously, both conceptually and in the depth with which I research my work. Also, in the way that I write about my work, and maybe even the way I speak (and/or choose not to speak) about some aspects of my work. I don’t separate my academic thinking process with my studio thinking process, so in a lot of ways, the two feeds into each other, and this is how I hope/expect it will be in the future. 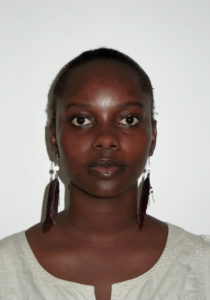 Rehema Chachage is a mixed media artist-working mostly in video and sculptural instillations as well as performance-based in Dar es Salaam, Tanzania. The themes explored in her work are very much determined by her situatedness, but the most prominent ones are ‘rootedness’ ‘gender’ and ‘identity’ explored in her earlier works from the point of view of a stranger, the outsider, the other, alien and often voiceless—a feeling gathered from the social alienation she experienced in the four years spent as a ‘cultural foreigner’ and a non-South African, black female student in a predominantly white middleclass oriented institution. Of late, her interest in these themes have steered her in the direction of exploring rituals as valuable tool for reading into social norms and tensions, including the woman’s identity, gender relations and subversion.